Imagine the media coverage if a Republican county claimed to just accidentally fail to submit a recount with a vote bump for a Democrat. A day after Florida's election left top state races too close to call, a Democratic party leader directed staffers and volunteers to share altered election forms with voters to fix signature problems on absentee ballots after the state's deadline. The altered forms surfaced in Broward, Santa Rosa, Citrus and Okaloosa counties and were reported to federal prosecutors to review for possible election fraud as Florida counties completed a required recount in three top races. But an email obtained by the USA TODAY NETWORK - Florida shows that Florida Democrats were organizing a broader statewide effort beyond those counties to give voters the altered forms to fix improper absentee ballots after the Nov. 5 deadline. Democratic party leaders provided staffers with copies of a form, known as a "cure affidavit," that had been modified to include an inaccurate Nov. 8 deadline. One Palm Beach Democratic activist said in an interview the idea was to have voters fix and submit as many absentee ballots as possible with the altered forms in hopes of later including them in vote totals if a judge ruled such ballots were allowed. Jake Sanders, a Democratic consultant in the Treasure Coast who saw the email, told the USA TODAY NETWORK - Florida that he warned party staffers about the legality of using an altered form, but was ignored. "I warned FDP staff members of the questionable legal status of altering a state form and misleading people their vote would be counted before the court case played out," Sanders said. "And coordinated campaign leadership told them to keep pushing it that, 'We are exhausting every possibility.'" ...To Sanders, the party was not being upfront with voters and "undermining making sure every vote counts." "They should have been saying, 'This is unprecedented. We are fighting for your vote to count. Fill this out so we can fight for you.' But self-imposing a fake deadline and deceiving people is counter to that," Sanders said. Last week, Florida voters elected me as their next U.S. Senator and now the ballots have been counted twice. I am incredibly proud and humbled by the opportunity to serve Florida in Washington. Our state needs to move forward. 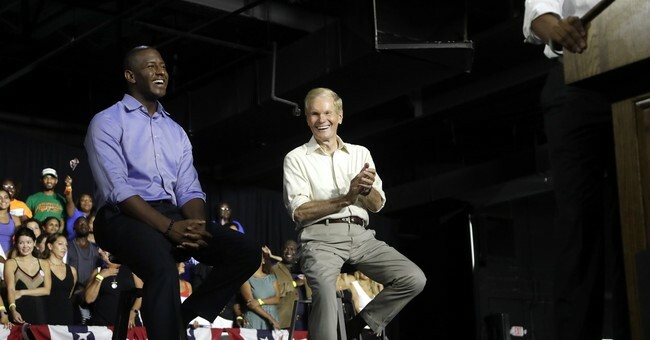 Neither Nelson nor Andrew Gillum have conceded, even though the initial recount confirmed that they've been defeated (Gillum rescinded a concession days ago). The Senate race is headed for a hand recount of a small subset of ballots with 'over' and 'under' votes, but few expect that process to shift the overall results. In recent days, the national media has scolded Republicans for supposedly fear-mongering about 'fraud' in Florida, even though their suspicions now appear to have been well-founded. They've also attacked the GOP for undermining faith in the electoral process. And yet, prominent Democrats from Cory Booker to Sherrod Brown to Hillary Clinton are openly and baselessly alleging that the Georgia gubernatorial election was somehow stolen or illegitimate -- and the losing candidate (who trails by well over 50,000 votes) is apparently mulling a lawsuit to demand a do-over election. The double standards are glaring.